Science - like life - doesn't always go according to plan. An Arctic expedition this year met with political and meteorological obstacles, and ended with a Coast Guard rescue. 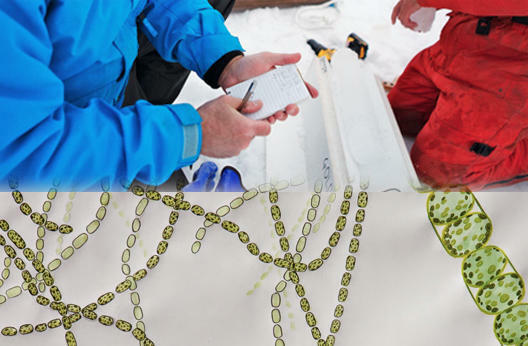 Top: Ken Golden and Chris Polashenski measure the ice core temperature. Bottom: Melosira, an ice algae diatom that lives in the sea ice and forms long chains. In 2011 scientists aboard the Coast Guard icebreaker Healy discovered a massive springtime plankton bloom, in fact, one of the largest ever observed in the Arctic. The kicker was that the bloom was in a place previously thought impossible – under solid sea ice. The discovery raised important questions about the ways climate change is altering Arctic ecosystems. For algal blooms to happen, two thins are needed: nutrients and sunlight. The former can be found in abundance during the Arctic spring, but the only way light can get through snow-covered solid ice is through “skylights” created by melt ponds on top of the ice. At least that was the only explanation researchers could come up with. 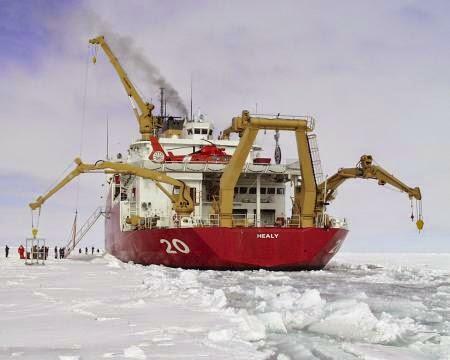 To test this idea, the Arctic Spring expedition headed back to the Chukchi Sea in May of 2014 with about 150 Coast Guard crewmen and nearly four dozen scientists, co-led by physical oceanographer Bob Pickart of Woods Hole Oceanographic Institution. The expedition also included an outreach torm, including visual artist Chelsea Clarke, dancer and choreographer Jody Sperling, outreach coordinator Ben Harden. But we all know the saying about best laid plans. Constrained by funding and geopolitics, and thwarted by a late-season snow storm, the Arctic Spring team had to head home without ever finding the under-ice algal bloom they sought. A second cruise attempted to continue the work, but got pulled away by the Coast Guard's rescue duties. It's enough to make one invoke things like fate or curses. But Pickart takes it all in stride, saying he and his colleagues will go back; they're already working on getting the funding necessary. And, while Clarke says it would have been nice to find the bloom and see even more plankton, she's still working on a large-scale exhibit based on the daily drawings she produced during the cruise. And it does make for a great story. We'll Get There Eventually from Ben Harden on Vimeo.